TRT: 64 MIN. The documentation of the installation of that name at the San Francisco Museum of Art. Discussions relating to the nature of beauty, the creative process, the synthesis of art and technology, art through psychedelics, the future of art, are held following the participants experiencing drawing, painting and the making of music. A vital teaching and learning experience accomplished with fun and satisfaction. We love this guy, he makes us laugh. He makes us not take things too seriously. He is really observant and this book is a good text on how to see whats going on around you too. 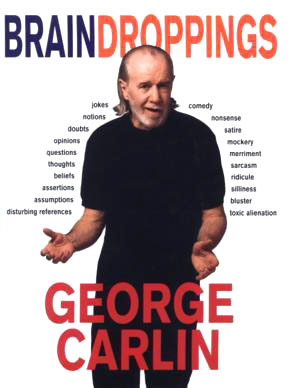 The thinking persons comic who uses words as weapons, George Carlin shares all-new, cutting-edge opinion and observational humor in Brain Droppings. Filled with thoughts, musing, questions, lists, beliefs, curiosities, monologues, asertions, assumptions, and other verbal ordeals, Brain Droppings is infectiously funny. 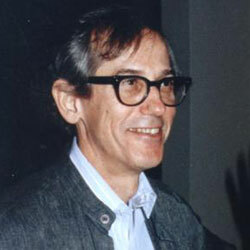 James Hillman is a Jungian analyst and former Director of Studies at the Jung Institute in Zurich, Switzerland. He is considered one of the most original thinkers in America today, especially in the broad world where psychoanalysis and creativity cross paths. He calls himself an "imaginal psychologist," and his writings have captured the imagination of novelists, poets, cultural historians and feminists, as well as his fellow analysts. His books include Anima: An Anatomy of a Personified Notion, Revisioning Psychology, InterViews: Conversations with Laura Pozzo, and The Puer Papers. Carolyn Marks is a sculptor, ritual artist and creator of One Thousand Tiles in the Spirit of Peace: a Wall for Berkeley. Jean Shinoda Bolen is author of the Tao of Psychology and Goddesses in Every Woman Bolen is a Jungian analyst and a clinical professor of psychiatry in San Francisco. She is on the board of the MS Foundation for Women and also teaches and leads seminars locally and throughout the country. Her forthcoming book is Gods in Every Man. Michael Bell, painter and curator; Thomasin Grimm, mixed-media artist; Squeak Carnwarth, painter and sculptor; Gary Knecht, architect; Mark Levy, art historian and critic; Jamie Brunson, painter and critic; Mary Snowden, painter; and Michael Beck, painter join the audience in discussing many facets of partnership and spirit in the art of the future. Gloria Orenstein is Associate Professor of Comparative Literature and The Program for the Study of women and Men in Society at UCLA. Her forthcoming book is A Gynocentric Vision: From the Suppression to the Reflowering of The Goddess in Art and Literature by Contemporary Women. This book situates the reclamation of the Goddess within an ecofeminist perspective. Excuse Me Your Life is Waiting. The Astonishing Power of Feelings. A walk through the gallery of photographs by Robert Maplethorpe discussed by the subject herself, Lisa Lyon. This is a must for any fan of Lisa Lyon - a cult beauty symbol in Japan. Mind over matter, mind surrounding matter. The tables are turned on Faustin and Brian. Richard Daab interviews. Megabrain. New Tools and Techniques for Brain Growth and Mind Expansion. Through modern technology, Glenn McKays psychedelic light-shows of the Sixties live again as a whole new video-art of the Nineties. 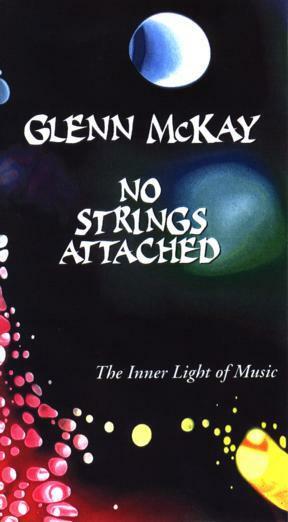 In this latest creation, No strings Attached, McKay weaves together a seamless experience of music and light to open not only our ears and eyes but also our heart and soul. This video is offered as a prelude to what will be showing at his upcoming four month-long light-art installation at the San Francisco Museum of Modern Art, opening in January 1999. Glenn McKay is the world renowned light-wizard who performed his visual magic at the Fillmore of the Sixties and with the Jefferson Airplane in their hey-day, while also performing at such art museums as the Whitney Museum in New York. 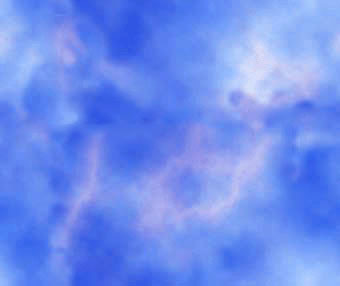 The visual music of the world giving birth to its self, New York Magazine. The colors seem to take on a life of their own, San Francisco Chronicle.